As the son of George Manuel, who served as president of the National Indian Brotherhood and founded the World Council of Indigenous Peoples in the 1970s, Arthur Manuel was born into the struggle. 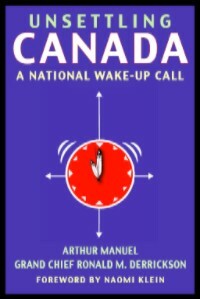 From his unique and personal perspective, as a Secwepemc leader and an Indigenous activist who has played a prominent role on the international stage, Arthur Manuel describes the victories and failures, the hopes and the fears of a generation of activists fighting for Aboriginal title and rights in Canada. Unsettling Canada chronicles the modern struggle for Indigenous rights covering fifty years of struggle over a wide range of historical, national, and recent international breakthroughs. For three weeks (and counting!) Unsettling Canada has been on the bestseller list for non-fiction! If you have read it, you will know why. If you haven’t you can get a copy here.